Left and Write: H is for : Highlander!! H is for : Highlander!! The above is the intro for the fourth season of a show that I would have sworn would never make it past the first....Highlander: The Series. To really understand the series, you have to understand the movie it was based on. 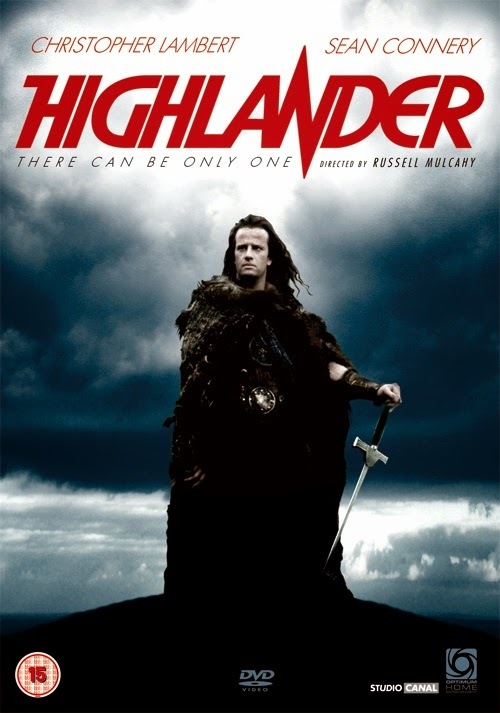 The original Highlander film starred Christopher Lambert and Sean Connery and put the idea out there that there were men and women, immortals, who could live forever, but only be killed by cutting off their heads. Now, as these immortals went about their business, hiding in the shadows, they were also playing "The Game". "The Game" was the term used for immortals hunting each other, battling to the death and, when one was killed (remember the head cutting off thing? ), their energy (or "quickening") would go to the victor to make them stronger. How would immortals be able to tell each other apart from normal folks? Glad you asked. They had an extra sense that would let them know when another immortal was nearby, which was also handy in preventing them from getting taken unawares. The more "quickening" an immortal took, the stronger they became until, as legend told, the few surviving immortals would meet for a final battle and the winner would claim "The Prize"....which, basically, amounted to them becoming like a god. Some rules that went along with The Game. The only weapon allowed was a bladed, melee, weapon. I have the power! Aye, the quickening that empowers me! I feel everything! I know... I know everything! I am everything! Highlander: The Series didn't come out until 1992. 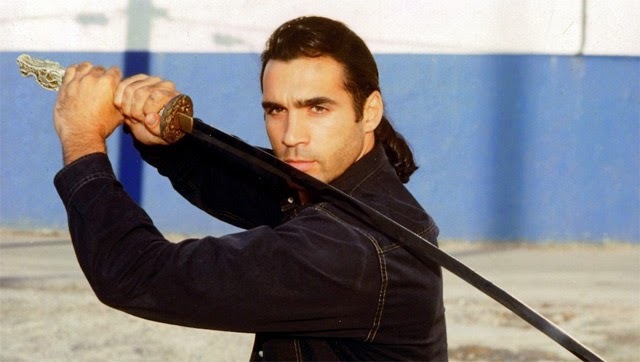 Starring Adrian Paul, the show chronicled the adventures of Duncan MacLeod, of the Clan MacLeod, an immortal fighting for the forces of good by striving to be the last, surviving immortal and claiming The Prize. He was a kinsman of Connor MacLeod, the lead character from the Highlander movie, who made a guest appearance on the pilot episode as a sort of 'handing off of the torch' to Paul's character. The cast changed up quite a bit. In the first few seasons MacLeod has a mortal girlfriend, Tessa Noel, and a streetwise kid who helps out around their antique store...Richie Ryan. When I first saw commercials for it, I'll admit, I scoffed. When I started watching the first season, I still scoffed due to it being very formulaic (MacLeod meets immortal...they fight....he wins...rinse, repeat). As the second season came out, though, I started thinking "Hey, this isn't half bad." From there things got very interesting as we were slowly introduced to a group known as The Watchers, who chronicled the lives of immortals and kept tabs on them. The Watchers added a whole new dynamic to the show and was a good part of what kept me tuning in each week. As with most shows, the final season went a bit off the rails, but it remained interesting as they were still trying different things and keeping the scripts fresh. In the end....there can be only one! On a brief side note, I once met Adrian Paul at a convention and, honestly, he was one of the nicest guys you'd ever meet. I expected some 'pretty boy snob', but he was quite the opposite. A very gracious actor who really appreciated the fans. Tune in tomorrow for a couple of real cool cats who made a living at The Cold War. I loved this show and crushed on Adrian Paul for several years. I really liked this show more as it progressed, too. Some of the repeat "guests" ranked among my favorites. I was never a devoted fan to the Highlanders but I was to Hart to Hart and Hogans Heroes. They were back in the days when I still watched TV in the evenings with the family but I seemed to to get away from it after I was alone. Cool you met Adrian Paul. I think I watched a couple episodes. First season probably. And after the horrible movie sequels, I was likely hesitant to try anything else Highlander. I've seen a few episodes of this show but never watched it enough to know what was going on. Now Hogan's Heroes? Loved it. We all (my friends and I) adored this series--and still do! We have a friend from Puerto Rico who's a prodigy at kendo, so we've come to call him "The Islander." He pretends to hate it, but he smiles every time someone uses that nickname! Now I understand the motivation behind one immortal killing another. Why is it always about power? Well, that and money. I really liked the tv show. The movies were not quite as enjoyable in my opinion. One of these days, I need to finish watching that series. My Dad loved this show and I watched it with him growing up. I liked Lambert and Adrian Paul both as Immortals. You're right though later seasons were better. Cheers. ::Swoons:: I love Highlander. I didn't think it woukd make it either, but glad it did! This movie has a huge legacy. I wonder if a reboot is in the works? @Robin: Agreed! Some of the reoccurring guests were very cool. Roger Daltry, especially. @Manzanita: Well, I was contractually obligated to mention Hart to Hart (or else my wife was going to punch me) and Hogan's Heroes has always been a favorite. @Alex: I can't blame you much. The first season was rough to get through, but still better than the sequels to the original. @Susan: Yep, Hogans' Heroes was a real classic, in my book. @Carol: I really liked the first one because it was something totally different than anything I had seen up to that time. The sequels....not so much. @Andrew: I need to go back and watch the last season, as well. @Maurice: I don't know, but it's one film I wouldn't mind seeing how Hollywood could re-imagine it. Sweet! Love the Highlander movie . . . I might just have to Netflix the show now . . . I should have given it a second chance. Of course, a lot of the show was filmed in and around Vancouver. That opening scene with the great big ball in the background is the Science Centre from Expo 86. I reckon Adrian Paul was starstruck meeting you, good human, Mark. Never missed this show. It was a favorite in the dargon cave. Hi Mark - well if Duncan Macleod is really around please send him in my direction .. I'd like to spend some time in his company! I loved Highlander, the tv series and the movies. so cool. My college friends and I called ourselves the ZeistMeisters and my nickname was (still is, in certain circles) Methos.